For many people, the burning sensation in their chest associated with heartburn is described as mild discomfort. However, if you experience heartburn regularly, this malady can have drastic effects: limiting your diet, necessitating the ingestion of daily medications, and even undergoing various medical procedures such as an endoscopy, which requires anesthesia. Far too frequently, the treatment for your heartburn is merely treating your symptoms. The danger lies in that you are not identifying the root cause of your heartburn. Consequently, even though you may feel relief with treatment, you may still have a hidden, festering, underlying health issue. 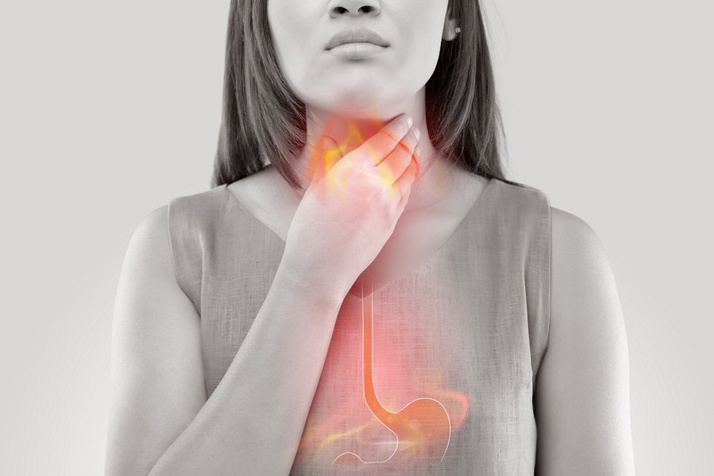 Acid reflux, also known as Gastro Esophageal Reflux Disease or GERD, occurs when your partially digested stomach contents travels up into your esophagus instead of down into your intestines. Why would this occur you may ask? Let us briefly explore the physiology of your digestion. Your digestive process is analogous to a car wash, where the food you eat goes through various steps to breakdown and extract the nutrition from the food you put in your mouth. When you eat something, a signal is sent to your nervous system to begin the process. Saliva is released into your mouth, which moistens and begins to break down your meal. You chew the food, further breaking it down and mixing the food bolus with saliva. This food bolus transports into your stomach through gravity and muscles in your esophagus “pushing” the food towards your stomach. Acid is released by cells in your stomach, which then breaks down your food even more. At this point, the mouthful of food that you ate a few minutes ago should be mostly digested and ready to pass into your intestines. However, before the food bolus can be safely transported to your intestine, the acidity must be neutralized by pancreatic fluid (that is extremely alkaline) otherwise you will burn your intestines. While in your small intestine, nutrients are extracted (transported) into your intestinal cells and the leftover residual contents of the food end up in your large intestine, where water is absorbed and waste material is collected to be excreted by your bowels. If any of the early steps in your digestive process is dysfunctional, you may end up with symptoms of acid reflux or GERD. Firstly, you must choose to eat foods that your body can digest. Many people suffer from GERD because they have difficulty digesting carbohydrates. The most common carbohydrate foods contain disaccharides (double sugars such as sucrose, lactose, and lactulose) and/or polysaccharides (many sugars) also known as starches. If you are someone who has trouble digesting carbohydrates it may be because you have insufficient or ineffective enzymes to properly digest these sugars and starches. Therefore, these foods remain undigested in your stomach, leading to microorganisms (bowel flora) digesting the carbohydrates and these microorganisms can release gas when they digest your food. Hence, excess pressure builds in your gastrointestinal system leading to reflux symptoms. Are you someone who feels the burn after spicy food? Some people are more sensitive to difference spices; it is not one size fits all. A bland diet, as many practitioners recommend, may help reduce your symptoms but more likely there are a multitude of reasons why you are experiencing reflux and not just the type of food you eat. Many people believe the myth that “acid is bad” for your body and “alkalinity is good”. There are many products available in the health and wellness marketplace that purport to cure disease or improve your overall health by reducing your acidity and increasing your alkalinity. There are entire systems of healing based upon this flawed notion of increasing your alkalinity. Moreover, products such as alkaline water permeate the health aisles of supermarkets and health food stores. The notion that acidity is the root cause of all disease is simplistic, unscientific, and actually wrong and potentially dangerous. The belief that excess acid is the major cause of reflux is false. In fact, if you incorporate an alkaline diet or take alkaline supplements, you can end up causing increased reflux symptoms. If you do not have enough stomach acid, your digestion will be impaired, and this undigested food is instead, digested by your bowel flora (intestinal micro-organisms). These organisms can excrete large amounts of gas as a byproduct of their digestion leading to increased pressure in your gastro-intestinal tract and reflux symptoms. Proper digestion requires a coordination of many processes, and this coordination is orchestrated by your autonomic nervous system (ANS). If you have problems with your ANS or try to eat while in a state of “fight or flight” (excessive sympathetic nervous system activity (SNS)), you may end up suffering from reflux symptoms. Do you ever notice that you may suffer a bout of indigestion if you eat too quickly or during an emotional conversation? This is because you are stimulating your fight or flight response, which impairs your digestion. You have trillions (not a typo or exaggeration) of organisms growing inside your body, most of which are in your intestines. If you have a healthy population of organisms, these tiny creatures help digest your food, produce needed nutrients (like vitamin K and B-12) and enhance your overall health. In fact, many, many chronic diseases are (at least partially) a consequence of abnormal bowel flora (dysbiosis). Dysbiosis can result from antibiotic use, poor quality diets, environmental mold exposure and various other stressors on your overall physiology. If you suffer from dysbiosis, you may manifest symptoms of acid reflux. Many metabolic imbalances can manifest as GERD or reflux. You could be overly catabolic leading to excess chloride injuring the epithelial cells of your intestinal lining. You could overly anabolic, contributing to a slowing of digestion, chronic constipation and low stomach acid. You could suffer from excess sympathetic tone (“fight or flight”) with a paucity of digestive secretions, excess parasympathetic tone (“rest and digest”) with excess gastrointestinal secretions. Do Acid Reflux Medications Work? The most commonly prescribed medications for someone with chronic acid reflux or GERD are H2 blockers (like Pepcid), proton pump inhibiters (like Nexium) or antacids (like Tums). These medications all work by either blocking your production of stomach acid or neutralizing your stomach acid. These drugs may temporarily improve your GERD symptoms. However, over time, these acid-reducing medications actually interfere with your ability to digest your food, alter your intestinal bowel flora, and impair your ability to absorb nutrients from your gastro-intestinal tract. Eventually these “tummy trouble” drugs can contribute to malnourishment, vitamin and mineral deficiencies, dysbiosis, small intestinal bowel overgrowth (SIBO), H.Pylori infections (the root cause of stomach ulcers) and many, many other chronic health problems. While it may be difficult to identify what may have caused your reflux on any particular occasion, what you must realize is that the only successful way to eliminate your reflux is to minimize the stressors that can push your body over the “threshold” that leads to your reflux. Maybe you are a little stressed while eating, maybe you do not have enough stomach acid, maybe you ate too much sugar, maybe you drank too much alcohol, maybe you ate too much spicy food, or some other factor is involved. This combination of factors created the perfect storm, setting the stage for a bout of reflux. Most people that suffer from GERD and reflux have other symptoms resulting from the underlying factors that manifested as that burning sensation in your stomach. Your reflux symptoms are not in a vacuum. Do you also have irritable bowel symptoms, headaches, asthma, allergies, unexplainable weight gain, etc.? When you come in for a consultation, I will run you through a battery of tests to try to determine the stressors on your systems to sort out the root cause of your GERD. Merely treating your symptoms with medications “good for reflux” may offer you short-term relief. Unfortunately, unless the root cause of your symptoms are identified, and corrected, your overall health will continue to suffer.